Previous bans in other cities have been widely ignored, correspondents say. 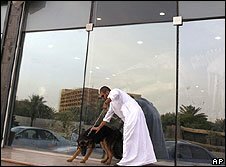 The penalty for people found walking pets in the Saudi capital is confiscation of the animal, according to reports in the local press this week. The religious police - known officially as the Commission for the Promotion of Virtue and Prevention of Vice - has the job of enforcing Saudi Arabia's strict interpretation of Islam. In the past they have targeted things like western pop music, fast food or the exchanging of gifts on St Valentine's Day. However, correspondents say someone walking a dog is an extremely rare sight in Riyadh, much less walking cats.